Eat multiple small meals a day, every 3 to 4 hours. The more frequently you eat the faster your metabolism. Eating the same quantity of food but spreading it out does not make you gain weight, just the opposite is true. Pack your own lunch when possible or provide yourself with healthy snacks. Apples, bananas, almonds, mixed nuts, dried fruit, granola or a package of oatmeal are all examples easily packed and nutritious snacks to use as your small meals. Portion control is crucial. Most foods are fine in moderation; likewise eating anything in excess can cause medical problems. e.g., large amounts of sodium or salt may increase your blood pressure. 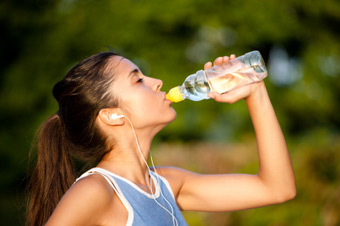 Studies have shown that drinking water can actually decrease your appetite. Replace high calorie soda with drinking water and drink water before you eat. Mom always said “Eat your vegetables”! 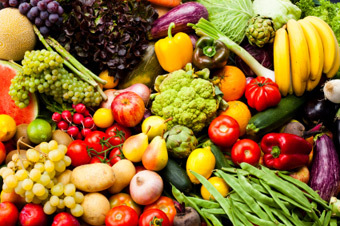 Vegetables are a great source for vitamins and minerals. These vitamins are necessary for a complete and healthy diet. If you don’t like eating vegetables try drinking a product like V8. It has multiple servings of vegetables in an easy and quick drink. Juicing is an alternative to eating raw vegetables and will add variety to your diet. If you are accustomed to having beverages with a high sugar content adding fruits such as grapes or apples into the juice will bring the juice closer to the sweetness you are accustomed to. Read nutritional labels. Find out how many servings are per container; you may be surprised. 3 & 4. The Nutrients: How Much? The nutrients listed first are the ones Americans generally eat in adequate amounts, or even too much. They are identified in yellow as Limit these Nutrients. Eating too much fat, saturated fat, transfat, cholesterol, or sodium may increase your risk of certain chronic diseases, like heart disease, some cancers, or high blood pressure. "Fat free" products are not necessarily healthy. The sugar and carbohydrate amounts are often increased to replace flavor that was lost. Certain Fats can be healthy. Eat foods that are rich in mono and poly unsaturated fats. Stay away from trans and saturated fats. Unsaturated fats will decrease bad cholesterol (LDL) and increase the good (HDL). As well unsaturated fats have healthy omega fatty acids. Calories may be important but don’t focus on the calories found in foods alone. Focus on where the calories come from. Some foods may be high in calories but be dense in nutrients. Other foods may have fewer calories however the calories are coming from an empty source of nutrients. Natural peanut butter may be good for you and is high in calories, but also poly and mono unsaturated fats. Unfortunately, French fries on the other hand are fried in saturated fats and have almost no positive nutritional value. A personal coach can make a tremendous difference by optimizing your exercise regimen and diet plan. Every individual is different in body composition and dietary habits, understanding your body and tailoring your work out regimen and eating pattern is key for results. For assistance from our own personal coaches, please send us an e-mail requesting more information to: info@logzzz.com.